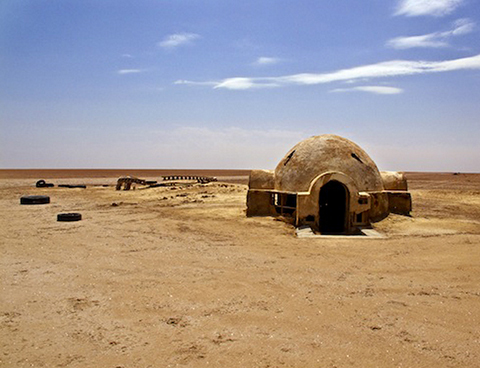 “These are not the ruins you’re looking for!” The archaeology of a galaxy far, far away? ‘A long time ago in a galaxy far away’ these words are so familiar as to be short hand for the beginning of a grand adventure! Much like the immortal words ‘Once upon a time’ or ‘Are you sitting comfortably?’ they are arresting and instantly significant. For generations they have peaked the interest of the movie-going public and almost like a mass pavlovian experiment, we can scarcely stop ourselves from re-playing the grand opening phrases of John Williams’ iconic score in our heads – perhaps making raspy lightsaber noises with pursed lips as we thrash our arms about… Just like a ‘real’ Jedi. However the truth is that George Lucas’ epic space opera did not take place in a galaxy far away, it was shot here on earth and while much of the more recent canon have relied on digitally rendered backgrounds, the iconic landscape of Tatooine is very much a real place! 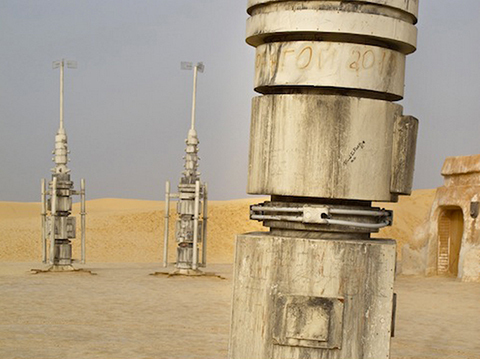 Moisture vaporators stand like monoliths in the desert. 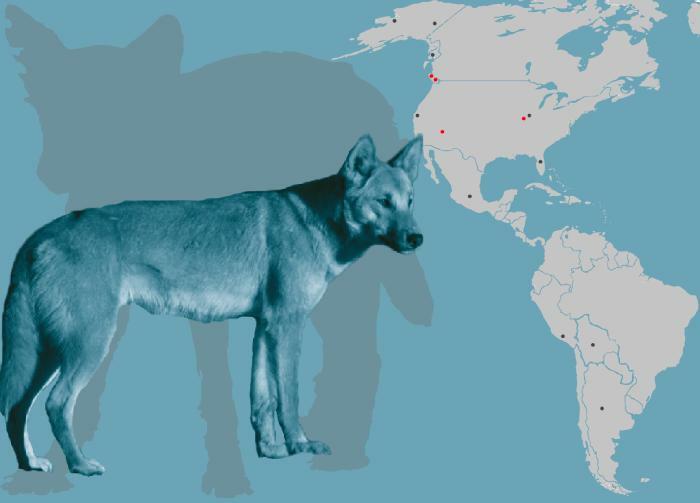 Image courtesy of Rä di Martino. We return to Rä coming upon the ruins of ‘Tatooine’ as one might approach the standing structure of Karnak or even the megaliths of Stonehenge. Though while those ruins are of cultures from the distant past, these are of cultures from the depths of human imagination. Some stand alone in the desert while others have been incorporated into towns and homesteads. She found the juxtaposition of these remnants of ‘another world’ and ‘real’ ruins fascinating and decided to feature them in a series of photographs entitled ‘Every World’s A Stage’. 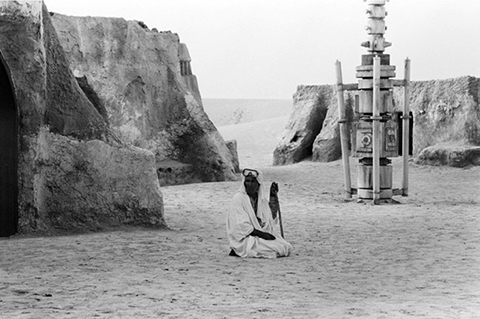 It is no secret that Tunisia was the stage and inspiration for Lucas’ vision of the desert world from which his protagonist clan, the Skywalkers, would set out to explore the universe. 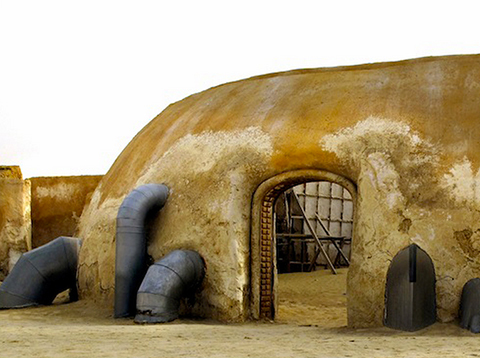 It has been remarked that the culture and architecture of Tatooine appears to have been ‘borrowed’ almost wholesale from the local people in Tunisia. Indeed, the name of this desert planet appears to have been directly inspired by a town in the south of the country, Tataouine. The distinctive blend of future and past real and un-real. Image courtesy of Rä di Martino. The standard practice of ‘Hollywood’ is usually to destroy relatively flimsy, wood and plaster sets as soon as the director shouts ‘cut’ for the last time. However a quirk of history kept many of the sets from Star Wars intact. 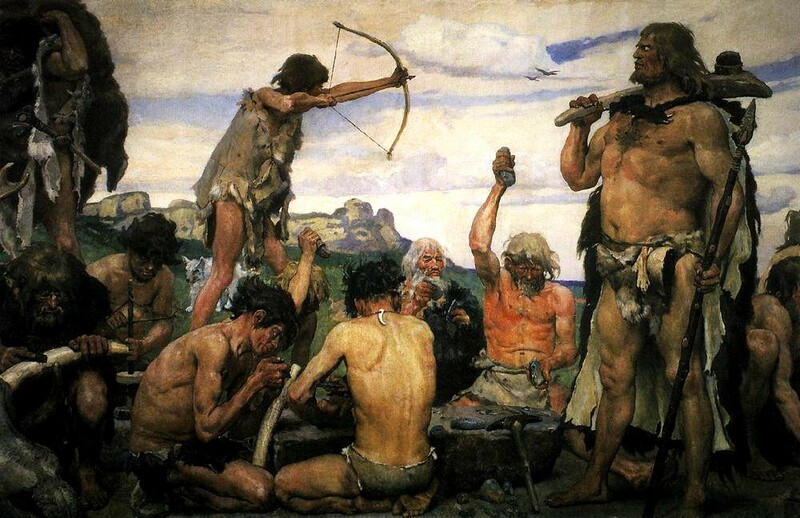 This is in part because some of them, the Lars homestead ‘pit’, for example was filmed in a real property but also because the film crew did not seem to feel the need to destroy these isolated works of art, one suspects that it would have cost more (and been too laborious) to demolish them in the heat of the day. It is at this juncture that I invite you to consider ‘What is an archaeological monument?’ The closest dictionary I have to hand defines ‘archaeology’ as ‘the scientific study of historic or prehistoric peoples and their cultures by analysis of their artefacts, inscriptions, monuments and other such remains’ and a ‘monument’ as ‘any building, megalith, place etc., surviving from a past age often of religious or historical significance’. By these definitions, might the ruins of Tatooine be straying into the purview of archaeology? After all these ruins are now older than some sites studied by urban or conflict archaeologists, they have changed history – being instrumental in shaping the popular culture of much of the world and they could, technically, be classed as being of religious significance! In the 2001 and 2011 census in England and Wales ‘Jedi’ was reported as a religion which for a time out-numbered Sikhism, Judaism, and Buddhism!*. 2012 also saw the story of Mark Dermul come to prominence. He is the Star Wars fan responsible for starting a campaign to save the Lars homestead and the website www.savelars.com. The website states that ‘in 2010, fans were flabbergasted with the poor state (that) one particular and very iconic location was in. The Lars Homestead was almost destroyed by the climate of the Tunisian desert’. This brought about the campaign to raise funds (more than $11,000) and restore the homestead to its ‘original’ condition. The so-called Arab Spring halted the project for a while but by October 2011, Tunisia’s new government provided the necessary documentation and permits for the restoration to go ahead. Are the ruins of a galaxy far away important in the real world of Tunisia? Image courtesy of Rä di Martino. This act of devotion may add to the argument for these ‘ruins’ to be counted as culturally significant but the story also highlights a pertinent truth, they are in a real country with real and pressing political concerns. Until recently many residents of the towns around the Tatooine sets could only have dreamed of the political rebellion depicted in Lucas’ vision, this contrast only serving to further divorce the care of the ‘ruins’ from the everyday concerns of Tunisians. Local people appear to value the Star Wars remnants according to how much tourism they attract and in the hiatus between the filming of ‘Return of the Jedi’ and ‘The Phantom Menace’ local interest reached an all-time low. At the time of going to press, I am yet to receive confirmation of any official policy to preserve the Star Wars remnants in Tunisia and, frankly, I suspect that the Tunisian government has (quite rightly) better things to do! However, the fascinating images captured by Rä di Martino, coupled with Mark Dermul’s campaign to save the internationally significant ‘place’ that is the surface ‘igloo’ of the Lars homestead lead me to wonder if it could be considered to be of archaeological significance. What makes a ruin archaeologically ‘significant’? Image courtesy of Rä di Martino. I once heard it said that ‘place is space objectified’. If monuments are simply significant places, I cannot help but wonder whether that significance can come as much from culturally significant imaginings as from culturally significant happenings- other realities as much as other times. 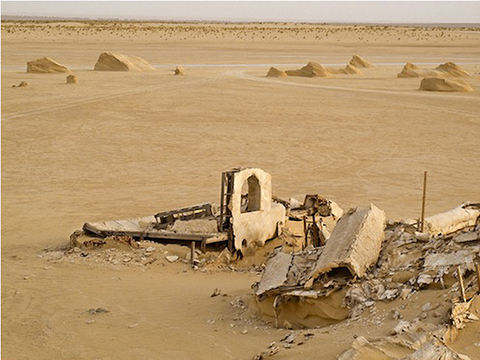 Much like Shelley’s Ozymandias, the Star Wars ruins of Tunisia inspire wonder though they have fallen into disrepair and much like that poem they are entirely imagined. 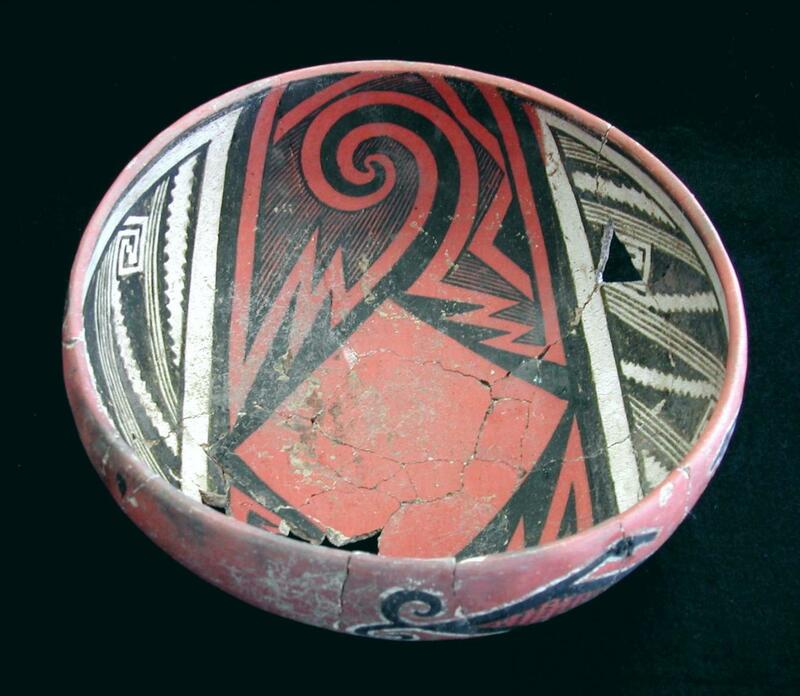 To paraphrase another science fiction staple, might we soon see archaeology embracing ‘strange new worlds’? *“Ethnicity and Religion: ‘Jedi'”. Census 2001. Special thanks to Rä for her kind permission to make use of her photographs. Click here to visit Rä di Martino’s website.